Dallas/Fort Worth hotel is in an ideal location. You'll receive superior accommodations in Dallas/Ft Worth (DFW) when you choose the Holiday Inn Express Hotel & Suites DFW North. Ideally located one mile from DFW Airport, our Dallas hotel offers several convenient services like a free shuttle to and from the airport. Short-term travelers and long-term visitors will both enjoy staying in our hotel in the DFW Metroplex. Visitors will find our DFW hotel the ultimate in convenience due to the area's business attractions. Situated among more than 8,000 companies, including 4 global headquarters for Fortune 500s, our DFW accommodations, multiple meeting rooms, and 24-hour business center fit the ambitious mindset of our local businesses. Travelers looking for hotels near DFW airport will be happy to find that we are only 12 miles from Six Flags and Wet 'n Wild Water World. The Galleria Mall, Grapevine Mills Mall, and Ft. Worth Stockyards have Texas treasures and souvenirs for you to remember your DFW vacation. Because every room is a newly renovated suite filled with new amenities, guests will feel at home throughout their DFW stay. Escape for a relaxing dip in our outdoor pool, and stay connected throughout your trip with free high-speed Internet access available in every room. 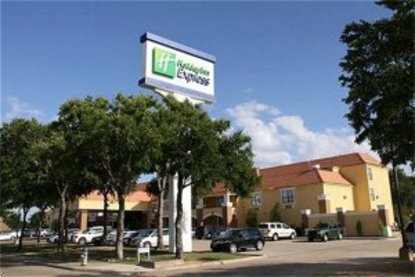 Whether you're enjoying a Texas family vacation or business trip, our Holiday Inn Express Hotel and Suites near DFW is the perfect choice. This hotel is committed to providing accessible facilities under the American Disabilities Act. If your accessibility needs are not met, please contact the Hotel Manager on Duty. Should you require additional information regarding accessible facilities for guests with disabilities, please call 1-800-Holiday (U.S. and Canada) or contact the hotel directly. For the hearing impaired, TDD service is available at 1-800-238-5544 within the U.S. and Canada.